One of the basic tenants of commercialism is the wanting of something more. The purpose of advertising and other marketing strategies are to convince the viewer that they want something they don’t have, and that they must work hard to get it. This constant desire for more lies at the heart of our materialistic society. For Warhol, this idea was something utterly fascinating. Working both against and with the idea of commercialism, Warhol worked with everyday materials as a way of showing that the things around us are worthy of as much respect, admiration and time as those we are taught to desire more. (Warhol, 2007) The things we already have can be as interesting as the things we don’t have, and therefore want. The most famous example would be the soup can series. (Warhol, 2007) Highlighting the simple form, elegant design, and purposeful existence. Andy Warhol (1964) 'Campbell's Soup Can'. Synthetic polymer paint on canvas. 50.8 x 40.6 cm. In 1964 Warhol produced ‘Brillo Box (soap pads).' (Levy and Scott-Clark, 2010) An accurate reproduction of a commercially available product, the boxes show his interest in the everyday commercialist world we live in. What I find most interesting about the work is that it is the container for the commercial object that has been reproduced. The ‘viewer,' or buyer, in this case, see the cardboard ancestor of this artwork not when they are buying or using it, but when it is being shipped to the shop for them to purchase. Acknowledging mass production, both in the making of the box and the meaning of it, the work was criticised for “capitulating to consumerism, ” (Levy and Scott-Clark, 2010) but that certainly wasn’t the prevailing opinion. Arthur Danto, an influential art critic, found Warhol’s Brillo boxes intriguing and wrote about them in an essay ‘Beyond the Brillo Box.' (Danto, 1998) In it, he surmised that it was Warhol, as the artist, that made these boxes anything more than what they were. Calling them “pretty good pieces of carpentry” (Danto, 1998) Danto speaks about them being indistinguishable from commercial brillo boxes, the only difference in them is the declaration from Warhol that they are art. Works like the box reproductions (Brillo pads were not the only source of influence in the 100 strong series that Warhol worked on) (Levy and Scott-Clark, 2010) blur the lines on authorship, primarily because of the way Warhol ran his practice. Andy Warhol (1964) 'Brillo Box (Soap Pads)'. Synthetic polymer paint and silkscreen ink on wood. 43.3 x 43.2 x 36.5 cm. Working with a team, Warhol often delegated tasks, creating a near conveyer belt for artists and technicians, all working as part of a collaborative authorship. In the first retrospective of his work in 1968 the entrance of the gallery was filled with 500 Brillo boxes, (Levy and Scott-Clark, 2010) but which boxes did Warhol work on himself, or even touch? And does that even matter? The art now exists and has become an autonomous entity in its own right, with inbuilt, ever-evolving meaning and message. Warhol often gave plans of work to be made to the manufacturer's (in this case meaning individuals) who would work away from the originator of the idea. This reproduction, authorised as it was, can be considered a controversial topic. There has since been an air of controversy surrounding the authenticity of the boxes. It is the authentication board of the Andy Warhol Foundation, which has the final say on what is and isn’t authentic. Any work authenticated by the board achieves artistic fame, and a catalogue number, those that don’t make it through the process are crudely stamped with the word ‘denied’ in red ink, defining and marking it as unwanted and useless. The controversy over the Brillo Boxes in the 1968 exhibition has since been explained. (Levy and Scott-Clark, 2010) A rather entrepreneurial curator Pontus Hulten, twisted in the controversy throughout, had claimed to make the boxes at Warhol's request before the retrospective. It has since come to light that the fabrication of the boxes was done in 1990, three years after Warhol died. His reasons for this have been argued and defended. A staunch critic of the consumerist art market Hulten did not need the money involved in a fraud like this. (Levy and Scott-Clark, 2010) I hesitate to use the term fraud. As an art student, I feel a sense of freedom to speak about this controversy regarding what it means for art. Regardless of the financial or moral implications of a ‘fraud’ like this, it brings up more questions about authenticity, providence and the falsity of the art market. In fact, this ‘fraud’ could more accurately be considered a piece of performance art itself. The fact that the authenticity of Warhol's works is so complicated questions the validity of the entire process. In 2003 a print was denied by the foundation, even though its provenance was solid and it even had Warhols signature on the work. (Levy and Scott-Clark, 2010) The defence for this rejection was that Warhol didn’t make the work, he only signed it. A disappointing response considering the way Warhol worked. Who is the artist? What is the art? Does the artist have to touch the art? If the works are a series of reproductions why does it matter which one Warhol touched? The notion of artistic genius is at the forefront of the argument once more. The authentication board has defended itself by stating that its purpose is to clarify the distinctions between what he did make and what he didn’t make. (Levy and Scott-Clark, 2010) Personally, I think the more important consideration is why there is a difference in value between the two. It doesn’t, however, negate the totality of Warhol's work; it only questions some of it. Rather than have a studio he called his space a factory. A contradicting conversation between art and production, Warhol argued that the two are inextricably linked. (Warhol, 2007) The lesson he saw in the factory is that we can produce things, things called art, in a different way than history would suggest. Traditionally, and in general terms, art is something that is created by an individual and enjoyed by an individual. The creation of 'Art' happens on massive scales, but the commercial side of the art world means that the final position for each piece is most often eventually either disposed of or owned by a single individual. For Warhol a way around this was reproduction. Which explains his interest in soup cans, screen printing, and Brillo boxes. Warhol wanted to apply the notions of commercialism and mass-production to the ‘good’ things in life. (Warhol, 2007) Things he saw as necessary to the continued development (as opposed to the current stagnation) of the human race. The issue that is in evidence through his attempted record-breaking printmaking goals, as well as other aspects of his life, is that art remains partitioned from mass production. (Warhol, 2007) That the art market exists and is the foundation for the continued existence of art is common knowledge, although still argued tremendously, it is a very different creature from mass-market commercialism, which Warhol arguably edged towards. Warhol’s legacy challenges future artists to change the world, in a mass populist way, through the medium (or message) of art. The implications of Warhol's work, and perspective are far-reaching, including into my own practice. I am a maker at heart, and it is through that production that I can question our assumptions about art and process, and hopefully inspire those questions in the viewer. Warhol did this, extremely successfully, in his own, unique way, I can only hope to do it in mine. Levy, A. and Scott-Clark, C. (2010) ‘Warhol’s box of tricks.’ The Guardian. [Online] Available from: https://www.theguardian.com/artanddesign/2010/aug/21/warhol-brillo-boxes-scandal-fraud [Accessed - 20.11.17]. Ally McGinn (2016) Kenneally. Artists rag with oil and acrylic. 134 x 91 cm. The idea of authorship is so interlinked with other ideas that it’s hard to isolate it without touching on a few other things. This post is a relatively brief exploration of the notion of authorship and associated concerns – originality, appropriation, ownership, authenticity, and creation. A few of these ideas were discussed in my dissertation, and the following is a more in-depth view of these ideas. Exploring the work of people like Derrida and other philosophers, we can see how interconnected and dependent the internal and external are in any artwork. In any piece of art, how much of the creation is due to the artist and how much to the ‘Artworld’? The question is not one that necessarily needs (or can be) to be answered, but its existence must be acknowledged to better understand the idea of authorship. Can we claim authorship over anything? It wouldn’t be difficult to argue that if there is no creation, then there is no authorship, that everything made is re-contextualising or re-presenting. However, that argument would change the perspective of ownership in the modern world and its history. It does beg the question, how can you claim ownership of an idea? An artist creates. This is one of the fundamental principles of art, whether contested or not (and it is highly contested). (Marriner, 2015) At the heart of this creation is the idea of originality. Modern society and the human condition seems to continually imply and reject the notion that everything has already been invented. There can be no entirely original inventions because even the smallest part of the whole has elements that have already been designed, made or explored. Is it only in the combination of existing things that originality is found? It is arguably true that total originality is a myth. As humans, we are combinations of genetic, historical and societal events and attributes that combine to form the person we become. Artworks, especially the good ones, are remarkably similar to people in this regard. Take any artwork, made anywhere in the world, and it is merely a matter of knowledge to be able to find the links to other artworks throughout history, as well as links to various different themes, issues, and ideas that exist in our world. Maybe there is no original art, just varying degrees of transparency? What is it that makes an artist the author of an artwork? If the ideas of creation and originality are questionable, then the question of authorship is even more muddied. It is generally agreed that art can be anything, or that anything can be art. This inclusion means that the question of the author becomes a complicated one. Is the manufacturer of paint an artist? The question then becomes one of language. What is the definition of an artist, and who gets to decide which people fit the bill? One crucial factor seems to be that the author has the ultimate responsibility to whatever objectives they choose to pursue through the work. Marcel Duchamp is the foundational figure of these ideas in art. His readymades, which were selected through “visual indifference” (Tompkins, 2013) and with a sense of irony and humour, epitomise nomination as an art form. If we take Duchamp's assertion that readymades can be art, which I most certainly do, then the tools that an artist uses are already art. If Michael Landy’s art bin (Bishop, 2005) is art, then so are the artworks artists deem non-art. Performance, environments, social change, and any other action or object that an artist chooses to nominate can be, and are, art…...but then who is the artist? A word must be said on appropriation; a word that is synonymous (in the art world) with authorship. Appropriation can be said to not only be a modern idea. Defined as the intentional borrowing, copying, and alteration of preexisting images and objects, appropriation has been considered a legitimate tool for artists as long as there has been art. Appropriation is defined as the art of using pre-existing objects or images with little or no transformation applied to them, which can be one description applied to both my process and some of the pieces created recently. In art terms to appropriate is to adapt, borrow, recycle or sample aspects (or the entire form) of human-made visual culture (although it can be argued that appropriation from naturally occurring visuals is also appropriation). What is considered the first piece of appropriation in art was done during the Cubist movement, although who did it first is still in question. (it was either Picasso or Braque) By adding a piece of oilcloth onto the canvas and later working with newspaper and other materials appropriation began through collage. The two then used appropriation to explore ideas of the significance of realism. Showing that appropriation, like creativity, can be considered a tool for the artist to examine broader questions. The practice of adding appropriated imagery has been expanded to include entire works of other artists, claimed by someone else, in blatant and defended plagiarism, Richard Prince being the prime example. (Richard Prince, Undated) Who famously appropriated images from Marlboro cigarettes, re-photographing them and presenting them as art. Appropriation was continued and developed by the Dadaists and collage artists like Kurt Schwitters. (Tate, Undated) Found objects had become a recognised material, and a tool artists began to think with. A link to another post can be found in Schwitters’ “Merz”, which is a precursor of the development of installation art. Surrealism took found objects and subverted our expectations of them to form new meaning. Later artists like Klaus Oldenberg (Evans, 2009) and Andy Warhol (Evans, 2009) appropriated commercial images and images from popular culture. To both artists pop culture is accessible to all, regardless of class, or education. No matter who you were, it meant the same thing. 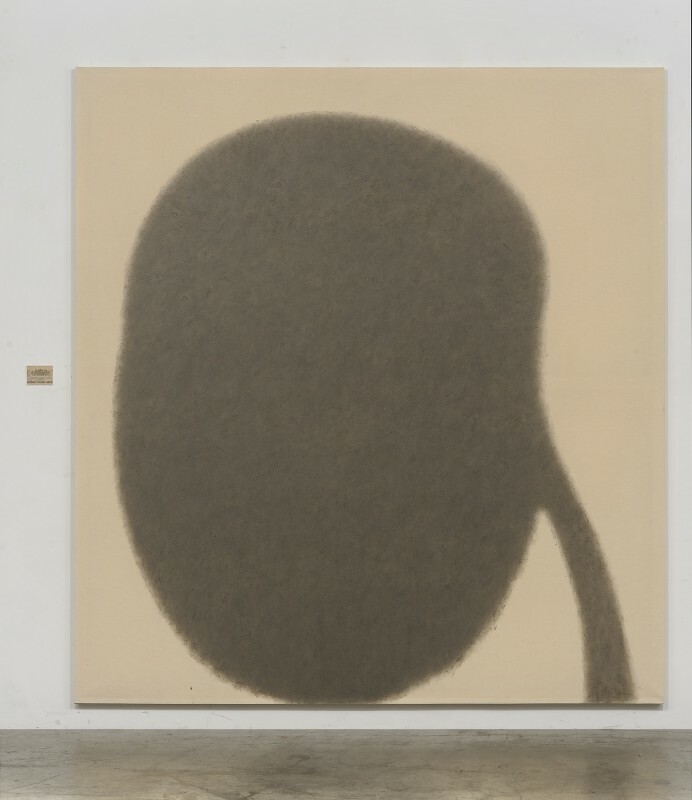 In the 1960’s appropriation artist, Elaine Sturtevant created works that were copies of other artworks, with little interaction, nominating them as art. (Evans, 2009) Created using the same techniques, occasionally with advice from the artist being copied, each work had a mistake in creation, to distinguish between the copy and original. This process, and the resulting ‘new’ work, openly acknowledges its status as a copy; challenging the concept of the author. When Duchamp nominated his readymades, and Warhol appropriated popular culture they chose certain objects to become art. The work of Sturtevant, and mine eschews this level of decision, by allowing other artists to determine what is worthy to be treated as art. Levine is primarily a photographer, popular in the 1980’s for reproducing, through photography, recognisable works of art. Through this change in medium, she questions the author of the artwork and the very nature of authorship. Sherrie Levine (1996) Fountain [Budda] Cast bronze. 30.48 x 40.32 x 45.72 cm. Levine explored this idea in sculpture, recreating ‘fountain’ by Marcel Duchamp in bronze (The Broad Gallery, Undated) (which is arguably as ‘real’ as replicas seen in galleries today - see my post on the Dali/Duchamp exhibition at the RA for more context around this comment) among other works. Artist Michael Mandiberg took this idea one step further in 2001. (Maniberg, 2001) He created an online archive of the images (taken from the same catalogue) which could be accessed and, with precise instructions, printed by anyone with access to the internet and a printer. Viewers can also print a certificate of authenticity (for a Mandiberg). Often, as can be seen with Levine, Mandiberg and Bidlo, the artists use the original ‘creator’s name in their own titles. Showing that the intention is not to steal, or otherwise claim any of the original skill of the works, indeed it could be said that their content becomes if not irrelevant than at least less important than the fact that they are appropriated. This is probably most interesting in the case of remade readymades, recreations of Duchamp's works. Arguably the second artist is doing what Duchamp himself did, albeit looking in a different ‘everyday’ for their source material - the everyday of the artworld. This is an extremely important point in my practice, and a term I often use when collecting materials from around my own, and others, working spaces. Appropriation has sparked in numerous copyright lawsuits. One of the reasons appropriation is such a controversial subject is the existence of the ‘Artworld’, a term coined by Arthur Danto (explained further in other posts) that describes the foundational context that surrounds any artwork. (Danto, 1964) As the revelation suggests, anything can be art, and art often challenges our assumptions, in which appropriation is a useful tool. Even when chance is considered, the artist is still deciding to include or remove something. This is what makes art open to interpretation, in questioning why the artist did something we can interpret the artwork as art. Total appropriation, or near enough, seems to eschew any responsibility for the details of the work. (Although there are enough artworks in existence, even famous ones, that the decision by these artists arguably comes in the choice of what to reproduce.) Instead, the works reflect the decisions taken by the artist subjects. My recent works have a similar sense of authorship and responsibility, although certainly on a scale. These artists are the authors of their work, this point is fact rather than opinion and is repeatedly evidenced. The fact that they are needs no arguing, but the reason is interesting and instead the subject of the work. They are art because they are nominated art, and the artists achieve the recognition of the work as such. That recognition is an important factor when considering the author of the work. Art is only Art with the existence of an artworld, and that artworld is built on a foundation of mutual recognition. The work of these, and other, artists could be seen as evidence that the author is dead. However, they are closer to comments on the purpose of authorship, and originality, than rejecting it. Appropriation artists are sometimes seen as undermining notions of artistic authorship and even skill, but the intention is usually far from negative, and in fact, serves as evidence that originality is not all it would appear, and that art has the potential to ask questions we might not typically ask. The pressure to be original is felt by artists around the world, and yet our very understanding of the term is flawed, we are an amalgamation of influences and experiences, as are artworks. The inclusion of appropriated materials can be done for many reasons, and different artists will have different interpretations of the meaning of these items, as will the viewers, but the inclusion itself has a particular meaning. One thing that these artists show is that originality is not a prerequisite for art. Along with the idea of originality comes the notion of authenticity. Primarily associated with the art market, there is an implicit authenticity required for something to be considered ‘Art’. There are of course exceptions to every rule, but generally, we trust that the ‘Art’ that we are looking at is what the artist is presenting it as, even if that is a planned pretence. There is also an element of trust implied within the art gallery, the level of which depends on the status of the institution. We expect works shown at the Royal Academy or the Tate to be ‘Art’ whether we like or understand it. Beyond the financial or historical implications, authenticity is, as many of the other terms in this text, a tool in the artist's work. It is used by artists to express ideas and to explore our understanding. Using the notion of authenticity can invoke questions about what we perceive as art. When an author claims a work as their own, they are claiming a form of temporary ownership. That ownership is vital for the nomination of the work as Art. As discussed above, contemporary art is filled with artists who have taken this conversation to its extreme, often resulting in lawsuits and lengthy debates over authenticity (another term intrinsically linked to this subject). If we accept that no work is original, then we are all plagiarists, and plagiarism is a fact of creation, rather than merely something to be avoided. Ownership, when discussed in the art world, brings the art market into the conversation, bringing with it the truth of the commodity that all artworks are - no matter the intention. Many of my pieces discus, or inspire, the artwork as a commodity (occasionally unintentionally) and whether that discussion is a rejection or a celebration is mostly a question for the viewer. From my perspective, I consider them both. I dislike the commercialism of the modern world and believe that it could be changed for the better but (in the art world at least) I understand the need for it and the purpose it has. These works have no internal answer to the question of whether the artwork as a commodity is a positive or a negative, they merely embody the question. A position I choose for many of my works. They are intentionally ambiguous on opinion. I think that is one of the reasons I always include chance elements and unwanted items, the removal of hierarchy and aesthetic preference negates the idea of opinion and adds to the questions invoked. At its foundation, it is important to remember that these ideas are metaphysical conversations. Each is as open to interpretation as art itself, and have inspired thinkers for centuries. The point, as convoluted as it seems, appears to be that nothing is as simple as it first looks. Authenticity, originality, authorship, and creation are all made complicated when applied to art. There is no substantial formula, nor any rules that cannot be broken. The critical factor in the examination of these issues is the artist. It is not in the creation of the work that these conversations exist but in defence and explanation of them. Regarding my work, these ideas recur regularly. From the collection of unwanted materials, failed experiments and placed canvases, each of my pieces contains an element of shared authorship. That shared authorship, when combined with other contextual features, seeks to question the definition and reality of art. IMPORTANT EDIT/REALISATION 10.12.17 - I've come to realise that writing and speaking (or language in general) is a form of appropriation. We rarely make up our own words. The personal element comes in our interpretation or understanding of the words, or gestures, of others. Bishop, C (2005) Installation Art. London: Tate Publishing. Evans, D. (2009) Appropriation (Documents of Contemporary Art). London: Whitechapel Art Gallery. Foucault, ‘What Is an Author?’, trans. Josué V. Harari, in Paul Rainbow (ed. ), The Foucault Reader (New York: Pantheon Books, 1984), pp. 101-120. Kabakov, I. (2000) ‘Ilya Kabakov (b. 1933) on installations’. In: Harrison, C and Wood, P. eds. Art in Theory:1900-2000 An Anthology of Changing Ideas. Blackwell: 1175-1180. Mandiberg, M (2001) After Sherrie Levine. [Online] Avaliable from : http://www.aftersherrielevine.com [Accessed 05.11.17]. Pichler, M. (2009) Statements on Appropriation. [Online] Avaliable from : http://www.ubu.com/papers/pichler_appropriation.html [Accessed 01.12.17]. Reiss, J. (2001) From Margin to Center: The Spaces of Installation Art. London: MIT Press. Richard Prince (Undated) Richard Prince. [Online] Avaliable from: http://www.richardprince.com [Accessed 04.11.17]. Richter, G. (2000) ‘Notes 1964-65’. In: Harrison, C and Wood, P. eds. Art in Theory:1900-2000 An Anthology of Changing Ideas. Blackwell: 757-760. Tate (Undated) Appropriation. [Online] Avaliable from: http://www.tate.org.uk/art/art-terms/a/appropriation [Accessed 03.11.17]. The Broad Gallery (Undated) Sherrie Levine, Fountain [Buddha]. 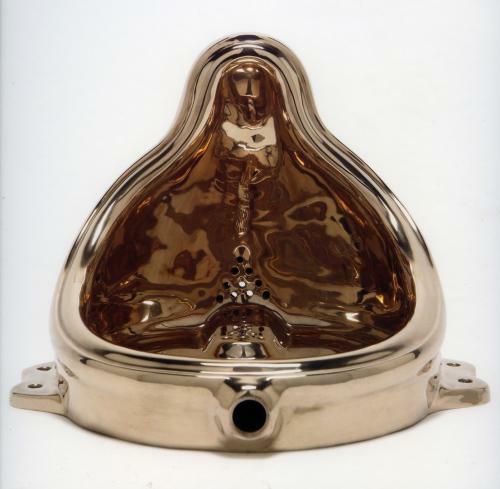 [Online] Avaliable from: https://www.thebroad.org/art/sherrie-levine/fountain-buddha [Accessed 05.11.17]. The worlds most expensive painting. (2011) [DVD] Russell England. UK: BBC1. The critical factor appears to be the moment when the other artist agrees that their action, object or artwork is not useful for them, and the moment I take ownership of them. The actions captured are those that the artist disregards - without canvas on the floor, wall or table those actions and marks would be lost. The objects are either finished containers, unwanted tools or 'broken' items. And the artworks are all either donated or sourced from bins - all regarded by the original author as unwanted. Once I take ownership of these objects (or objectifications in the case of placed canvases), they become the materials of my practice. Through this filter, they are in turn nominated and presented as Art. Without that filter they remain what they once were because it is only through the nomination that they are put forward to be understood, questioned and interpreted as Art. The fact that an object can be collected and presented, without interaction, as art shows that it is the nomination that counts. That the nomination is done by me could, arguably, be enough to count myself as the author. However, I have to note that even when referring to the placed canvases in passing I refer to them as if they belonged to the artist whose actions are collected. This could be because the artist becomes an adjective rather than a noun. The descriptor of these works is the artist involved. This conflict of description only seems to occur when dealing with the placed canvases and unwanted works - materials, tools, and general rubbish seem free of author-dilemma. The collaborative authorship of these pieces negates some of the automatic personal associations between author and work. Adding to the unintentional narrative of the pieces. When thinking about the originality of these pieces, I believe they are often more original than the artworks created during their use. They are referencing and collecting process, and in themselves are completely honest, the occasional dishonesty comes through my interaction. Their originality can be compared to other works about a similar subject of course, but I (as with most artists) can only hope that they are original enough. Their authenticity is harder to pin down, by intention. They are what they are, they have a reality, as do all objects. They are authentically what they are, and when questioned I, as the artist, always tell the truth about their origins and process. However if not challenged, or when seen and not investigated further, some of the works (primarily the found or placed canvases) are misleading, pretending to be something they are not. The viewer may assume that the marks are intentional, or created in an alternative way. I discuss this because many people seem surprised when they hear how the works are made, and it has been suggested that my current interaction with the work is not enough to call it art. I have found evidence of this when discussing the works with visiting tutors and other students or viewers. When informed of how they were made (especially the piece - Even babies lie) viewers are often surprised. That the nomination, not the interaction, is enough for consideration as art is evidenced in historical canon. Further actions from me either solidify or negate the nomination. Martin Heidegger is considered one of the leading philosophers of the 20th century. Heidegger was a prolific writer, influential in many fields of study, whose main field of interest was ontology and the nature of being. (Bolt, 2011) This post offers a brief introduction to his work, theories and a few key points in relation to my practice. This text began as a short overview but has gotten more complex as I've engaged with Heidegger's writings more. In ‘Being and Time’ Heidegger referred to subjects and objects as ‘beings’. Heidegger defines many types of beings in our world, where humans are the only ones who care about the nature of their own being. Heidegger saw this self-referential thinking as something that marked human beings as separate from the other beings, and as an attempted stand against the flow of time. This text highlights the important factor of ‘being-in-the-world’ and ‘being-with-others’ (Bolt, 2011) which are both ways of describing an important fact of our being; that we exist in relationship with our surroundings and are formed and informed by those relationships. This directly challenges the notion of ‘distance’ from theory, as the theory is so inexorably linked to the physical that it cannot be undone. Heidegger views this perspective as an unattainable objective, which would seem to fit with the poststructuralist perspective. Heidegger uses the term ‘Dasein’ translated as ‘there being’ (Bolt, 2011) and meaning both human beings and the state of being, which he saw as indistinguishable from one another. Daseins are individual and yet interrelate with one another. This sense of ‘they’ is important in understanding human nature and the societies we live in, which are based on assumptions and perspectives of ‘they’. In art, we often respond to our ‘thrownness’ and we are certainly formed by the ‘facticity’ of our lives. When seen in this way the relationship of this deconstructed, interrelated, narrative to Derrida and Danto’s theories about the nature of the interiority and exteriority of art (that the artwork doesn't exist in separation from its context) seems obvious. Daesin is an interesting term because of its tendency towards self-fulfilment. A term Heidegger refers to as ‘projection’ (Bolt, 2011) which I've taken as; the ways ‘beings’ (who are in daesin at all times) explore and react to the world around them through a process of ‘being’. Our ‘facticity’ ‘projects’ a daesin’s ‘being’ through in a process of continual ‘thrownness’. Note - I could be wrong here, Heidegger is dense and subjective, but that's my interpretation of it. Heidegger saw a distinction between everyday daesin and daesin, which can be seen as the difference between being, and questioning that being. (Bolt, 2011) The act of being in everyday terms obstructs the ontological examination of being. Heidegger sees this as a form of inauthenticity, an objective term that is a fact of life as a being. An authentic experience of daesin is one of contemplation of self. Heidegger and other philosophers have noted a distinction between human ‘beings’ and other ‘beings’ but many agree that objects have a ‘being’. This reminder serves to note that when Heidegger is speaking about ‘being’ and the reliance upon ‘being-in-the-world', those theories can be applied to other types of ‘being’ (with varying degrees of success) including artworks. In ‘Being and Time’, Heidegger posits the relationship between caring and being. “I care, therefore I am” (Steiner, 1978: 101). Without a form of caring we wouldn't exist, if we experienced an encompassing apathy we would stop moving, interacting, being. Descartes posited ‘I think therefore I am’ beginning a philosophical stance that pronounces the thought as the only truly ‘knowable’ fact. Heidegger highlights the impossibility of this statement, we cannot detach ourselves from reality enough to make this distinction. We are in the world and therefore our experience of it, and thoughts about it, are inextricably linked to it, as are all other ‘beings’, artworks included. (Bolt, 2011) This is a stance that resonates deeply with me, and a perspective I have long had without necessarily being able to articulate it. In ‘The Essence of Truth’ he proposed the idea of caring as a catalyst for truth. (Stanford, 2015) (the word caring, as above, is seen as an interest of some kind) To Heidegger, you must care about something before you can know the truth about it, another resonating thought. Our being exists in the universe, with numerous external influences happening constantly, our interest is drawn, which leads to the uncovering of truth. Truth is rarely something easily seen and is more often read or interpreted. In this way caring can also be described as an effort, I think, in that we must first engage with something to comprehend the truth of it, which takes an effort of some kind. I like this perspective on truth, as it acknowledges an element of autonomy in truth, that it can objectively exist, to some extent, external to the human perceiving it, and it therefore re can be discovered in some way. Art is separate from the two again, Heidegger saw art as the source for both artwork and artist. In this way, art becomes both the origin of and the goal for the artist and artwork, a cyclical dynamic relationship. A view I find particularly interesting, and something that has inspired a great deal of thinking. 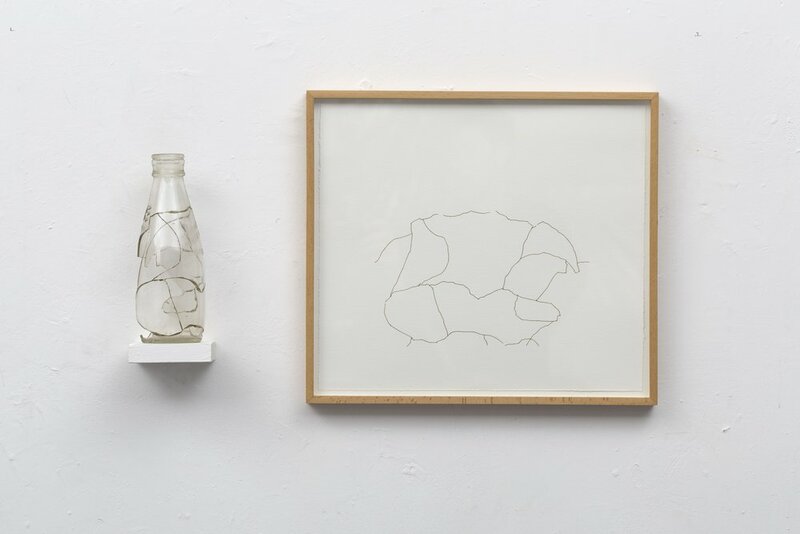 This separation of artwork(object), artist(subject) and art(process) has been discussed further by the modern understanding of visual culture, and the semiotic interpretation of it. That meaning is external to the work as well as internal (or both as Derrida argued) is widely accepted, Heidegger seems to advocate the necessity of understanding the separation and the reliance of each upon the others. This appears to relate to Wittgenstein's ‘family resemblance’ theory. In simple terms he saw the value of art as more than an appreciation of aesthetics, and that by reducing art to a form of sensory entertainment we are missing much of its true value, and purpose in the development of consciousness and understanding of beings. Artworks are more than simple memesis, they are steps in the meaning of what it is to exist. It could be described as; Art is the science of the senses. The -ology of the senses, using the senses. This is a thought I plan to return to as it is an exploration of these behaviours where I find my process sits. I would argue that it also gives art a finite purpose, in the experience of the moment and for the gain of the subject, which, while often true is not always the case. One of the most critical terms I have come across while researching Heidegger is ‘poiesis’ which can be defined as the work existing in a place of balance between the poetic and the enframed. The enframed comes from the word ‘Gestell’ meaning framing. (Bolt, 2011) Which, much like Derrida's ‘Parergon’, is a literal or metaphysical construct that shapes the way we view or experience something, in this case, an artwork. Bolt compares the ‘gestell’ to a window frame or skeleton, so as something that supports and underpins the ‘subject’ but remains distinct from it, or hidden in light of the true ‘subject’. Many artists would consider this contextualising, however, it also includes elements of practice, emotion, location etc. The poetic state of practice is the fluid and flowing creative status an artist reaches, while working, which allows the revealing of hidden truths in the work, or in its process, that potentially lead to the ‘final’ ‘artwork’. The important factor is that art sits in the Venn space between the two and that the artists practice winds on a route between the two. This is something that I've been edging around recently, it has come up in lectures, tutorials and studio practice, as the idea of what practice is. This is a very important point for my practice and an articulate description of the way I work in the studio. The debate about the impact of his anti-semitism on the validity of his philosophical works seems to be ongoing, and not something I'm going to discuss here, however, it is certainly something to bear in mind, especially given how affirming I have found reading his works to be. Personally, I like to think that the work someone does can exist, to an extent, in separation from the person they were/are. The idea, and whether it resonates, is more important than the speaker. Comes from the word ‘praxis’ which is defined by Aristotle as process/practice distinguished from and yet intertwined with, theory. The Cambridge dictionary defines it as “ the process of using a theory or something that you have learned in a practical way”. An important term in art. Art, certainly in my practice, is an act of praxis. Researching Heidegger has shown an interesting perspective on the production and interpretation of art. I began this research after hearing about the idea of the space between the enframed and poetic. However, the research has led to something more. Heidegger not only explored ‘being’ but embraced the reality of it. His theories around ‘being’ rely and impress on us that we are already ‘being’. Practice and theory combined. The main thing that this research, and the writing of this text, has shown me is that there is a lot more research to be done. Heidegger, and reading through the rest of ‘Heidegger Reframed’ forms part of my ongoing research plans. Bolt, B (2011) Heidegger reframed. London: I.B. Tauris. Heidegger, M; trans. David Farrell Krell (2008). "The Origin of the Work of Art". Martin Heidegger: The Basic Writings. New York: HarperCollins. Palmer, D. (1998) ‘Heidegger and the ontological significance of the work of art’, British Journal of Aesthetics, vol. 38 no.4, pp. 394-412. Rothman, J. (2014) Is Heidegger contaminated by nazism? [Online] The New Yorker. Available from: https://www.newyorker.com/books/page-turner/is-heidegger-contaminated-by-nazism [Accessed - 21.11.17]. Stanford (2015) Heidegger’s Aesthetics. [Online] Stanford Encyclopedia of Philosophy. Available from : https://plato.stanford.edu/entries/heidegger-aesthetics/ [Accessed - 02.11.17]. Steiner, G (1978) Martin Heidegger. Chicago: University of Chicago Press. Stulberg, R (1973) Heidegger and the Origin of the Work of Art: An Explication, The Journal of Aesthetics and Art Criticism, Vol 32 no.2, pp, 257-265. Zielinski, L (2016) In His Own Words [Online] The Paris Review. Avaliable from: https://www.theparisreview.org/blog/2016/10/18/in-his-own-words/ [Accessed - 21.11.17]. This week we held our MA Open Studios event. So much of the week was taken with presentation tests and adjustments. Ally McGinn (2017) Studio Mushroom. [Working Title]. Studio detritus. Size varies, approximately 5 x 5 x 2 cm. This piece is more about the perceptual association of a mushroom than a pre-conceived idea or inspiration from nature. Ally McGinn (2017) Open studios view. 6.12.17. This is the final view of my set up for the Open Studios event. None of the working elements of the studio were removed, and it was interesting to see the engagement people had with that element of things. The differences between studio and gallery can be seen in situ here. The difference is part of the work and it gives insight into the mind of the artist, and the working process of creating art. I think this is an interesting point for the work, as I am interested in the communication of perceptual questions. Seeing all the elements I have considered for inclusion in the work questions why those elements were chosen while inspiring a transitory state for these objects; the idea that it could change at any moment. I would be interested to explore the idea of changing an element of the installation between each day of an exhibition. A detail shot of the space behind the canvas wall, a space of storage and potential. There is something brilliant about this. It is an organic, aesthetically unconsidered (for the most part) installation. Ordered chaos. Ally McGinn (2017) Reading a painting, process shot. Binding this painting into a book is progressing well. The book is bound with a handmade linen hardback cover. The process is being documented in 'Reading a Painting'. This book was easily the most conversational element of my installation, at least during the evening of the Open Studios. It drew interaction and questions from viewers. Which is something I'm going to consider. I have explored many of the reasons for making this book in the post ‘Reading a Painting’ but I enjoy the dichotomy of choice and focus that it brings to the viewer; they can choose which pages to linger on (and do) and yet they are focussing on individual elements more than they might at a distance. It forces a physical interaction with painting. I would like to replicate this process on a representational painting. Painting an addition onto the floor of 'Enframed'. This piece began with the grey elements. As a form of equalising the materials while disguising their primary qualities. The frame came into the work, partly, as a result of reading Heidegger. The golden frame is garish, and many people dislike it, but I enjoy the juxtaposition of Matt grey against the dusky shine of the golden frame. 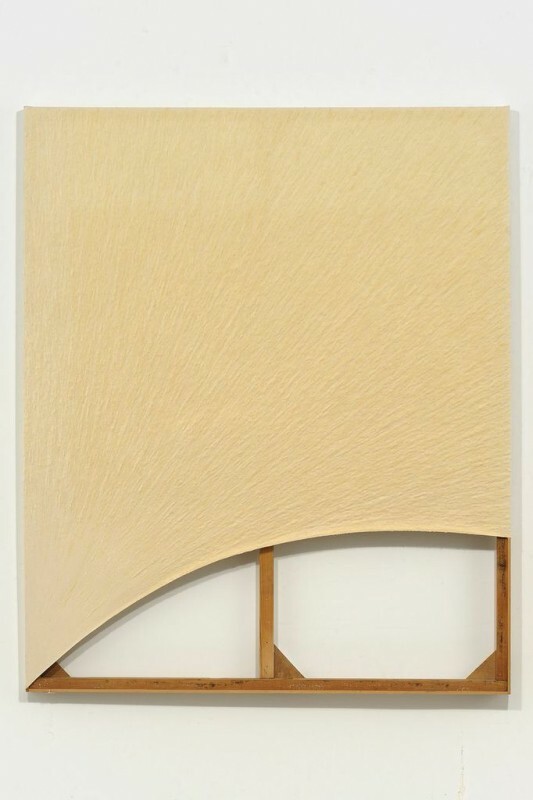 The canvas behind the frame brings this piece firmly into the world of painting while highlighting its spatial qualities and materially enlarging the space of the work. One of the small interventions I placed around the studios. The bottles are filled with studio dust, during the stages of turning it into paint, and a collection of screws. The photo is a water mark on the floor after stretching a canvas. 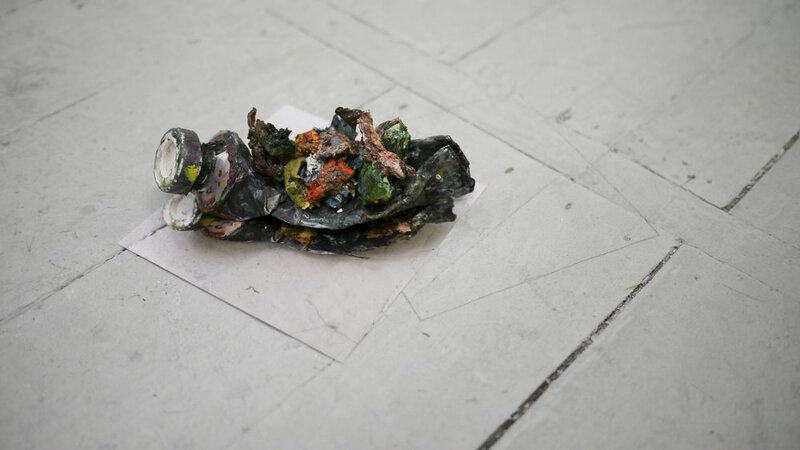 The combination of the material and the representational form a representation of the process in a studio. They were placed on a conduit on the wall, at chest height (bearing in mind I'm 5ft 4). The arrow is pointing to a fire exit but is repurposed here to direct the gaze to the ‘Art’. Is this sculpture or fruit painted grey, repurposed into purposelessness. A definition of art. One of the small interventions I placed around the studios. My daughters reaction to this piece will be the subject of one of my final posts. One of the small interventions I placed around the studios, this one remained on my desk. Something I have only recently been exploring in research is the impact capitalism has on our society. It is something I have explored in other areas of my life, but have not associated those opinions with my work. As usual, in retrospect, this seems like an oversight. This post serves as a short note to my burgeoning interest in this complex subject, it in no way summarises it, but it dents the surface. Ally McGinn (2017) Untitled. Digital prints, basket and elastic bands. Size varies [Prints are 6 x 4 and 5 x 5]. That the ‘rich get richer’, another wording for the above, has enabled the dominant class to subsume surplus in our society, in the form of profit. This surplus, which implies a level of affluence that most working people do not feel, is used by those in power to retain and support the current sociological structure. The reality is; we live in an affluent society. There is enough for everyone. The waste we produced is more shockingly lopsided when seen against the vast cases of people who lack the ‘basic’ things we need. This surplus is coming from somewhere, and it comes at the cost of the workers. People whose only choice is to sell their labour. Many people describe feeling a void in their lives. More, arguably, are familiar with the idea that we have to work in a job we don't like in order to afford to live the way we want to live. We live in an affluent society, but that affluence is not equally distributed. Economic control remains in the hands of those who have economic mobility, generally the bourgeoisie. (One of the many points that could be taken further here is the emergence of technology and the ability of those with low economic mobility to change that status - which is far higher than it has been previously. But that's a discussion for another time. We work in jobs we generally don't like and do many other things we don't enjoy doing, in order to be able to afford the things that shape the quality of the rest of our lives. We fill the void of alienation we feel, because of the shape of our societies, with ‘things’ but those ‘things’ cannot, and do not, fill the void. So the cycle repeats. It may be possible to suggest that the cycle Marx described is now happening on an individual level. We realise something is missing, look for something to fill it, find adverts and other suggestions that we can fill it with some consumable thing, we attain that thing (this part of the process can take years) and then comes the inevitable realisation that the void is still there. We like this new ‘thing’ we have but it has not done what we were lead to believe it would do. We shape a version of the people we want to be with ‘things’ around us. We use them to help us define ourselves. But those definitions and those ‘things’ define us far more by their semiotic significance than any apparent surface values. Culture Industries can have a negative impact on the understanding of ‘good’ art. Not all art has to be seen as good by the majority, in fact, the opposite is likely true. The better works are actually more likely to be those that don’t fit the ideas of the majority. The effect of culture on mass media on art is the normalisation of it. It is a requirement of mass media that it fit the values or taste of thousands, potentially millions. This shapes the work that is made at all levels. Whether we like to admit it or not we are part of a capitalist society and it is extremely difficult to remove ourselves from that society. We must earn money to live, and this impacts the way we do things. What does all of this have to do with my work? The first impact relates to my general outlook and perspective. I can now describe myself confidently as a Marxist, I am against the capitalist society, and reject many forms of it in my home life. This is not a new thought inspired by research, but a development of a perspective born of a response to our society. What I have not explored before is the impact of that perspective on my work in the studio. It is simple to see the most obvious link, the choice of materials and subject in the studio. I work with materials that have fulfilled, failed, or have yet to achieve, their purpose. I deal with accidental and incidental objects and observations, which reject the notion that we should focus on certain things and ignore others. We are a society of blinkered individuals, we look at the things we are supposed to look at and ignore those we don't. My materials question purpose and function, which is then deepened by my process with the materials in the studio. The other ways this perspective influences my work are numerous, and the more I explore the idea the more I find. This document has the potential to get much longer. I look forward to being able to use this perspective as a tool in the studio as well as a subconscious influence. The power of research can be that it can highlight, articulate and solidify things we already think, and make us realise the connections inherent in being a thinking being. West, S. (2017) ‘The Frankfurt School pt 3 - The Culture Industry’, Philosophize This!. [Podcast] Avaliable from : http://philosophizethis.org/episode-110-transcript/ [Accessed - 05.12.17]. Jeffries, S. (2012) ‘Why Marxism is on the rise again’. The Guardian. [Online]. Avaliable from: https://www.theguardian.com/world/2012/jul/04/the-return-of-marxism [Accessed 6.12.17]. Woodfin, R. (2014) Introducing Marxism: A Graphic Guide. [e-book] London: Icon Books Ltd. Avaliable from: https://www.amazon.co.uk/Introducing-Marxism-Graphic-Guide-ebook/dp/B00KFEK0FQ/ref=sr_1_1?ie=UTF8&qid=1512506601&sr=8-1&keywords=marxism [Accessed 26.10.12]. I'm expecting this to be a long and convoluted text, and it comes from a discussion with my husband, who is interested in conceptual music and sound. The moment an artwork is seen or experienced it is changed by that interaction. This happens in two ways, firstly on the individual level - the individual artwork changes once it is seen, the viewer's interpretation, critical reception, contextual relation and curated exhibition affect the work and the interpretation of it. The second level is slightly more complex, and yet also individual, the level of continued practice for the individual experiencing the process of art (the artist). Whether that change is positive or negative is likely a subjective fact, it will differ in different cases, but it's worth noting that the change exists. Artists, and by extension musicians and other creators, often describe trying to get ‘in the flow’ or ‘in the zone’. Which is linked to Heidegger's theories about the optimum state for art, which is in the area between the poetic and the enframed. In Heidegger's writings, the artist aims to exist in this state when creating art. Through the contextualisation of my practice, my overabundant research and my own self-pressured methodology I have been enframing my practice, to the extent that I'm unable to reach the poetic. Personal note - I need to stop reading, stop writing and start working for a few days at least. This ideal state of working is not something to be achieved once and then ticked off, it is a state of the moment and often comes and goes (between the enframed and the poetic). Thinking about it in this way I can almost see which works I've made in the studio that have been linked more to enframing and poiesis, and the ‘good’ works are definitely those created in moments of poiesis. The ‘moment’ relates once more to Heidegger, and his term ‘throwness’ which is about the moment of existence, constantly happening and happened. Another perspective for the change that occurs upon viewing the work is through the human activities of art and music (and by extension others). In the book ‘Strange Tools,’ the author supposes two levels of human activity. The first is the primal, basic level, it is the things we as ‘beings’ do. This level includes dancing, communicating, creating sound, making art/images, running, and numerous other things. The second level is the organised activity of that act, including, choreography, writing, music, art, sports etc. When thinking about the creation of art and the change that perception brings it would seem to lead that the level 2 activity of making ‘Art’ impacts the level 1 practice of making art. It's possible that we have achieved a level of ‘Artworld’ that means that the level 1 activity doesn't really exist anymore, but it feels more like, as Heidegger seems to suggest, that artists are tapping into the level 1 activity when they get ‘in-the-flow’. Artists (and the extension applies once more) work with the level 1 experience, and then process it through a level 2 organisation to stimulate a level 1 experience in another person. The other implication to the realisation that perception changes the ‘Art’, in both ways, is the link to the observer effect in quantum physics, in which the ‘observer affects the observed reality’. It seems obvious to state that I am not a quantum physicist, and so I won’t attempt to go into more detail here but the link is an interesting one that I would like to come back to. The other is a frustration at the issues I'm facing with an overabundance of context at the moment, a reflection on my research practice. I’ve come to realise that I need to step back slightly and attempt to get back into the level 1 activities suggested here. Focussing on a practice of poiesis. However, this realisation has led to an idea for a piece of work, which is a fact about my practice that I adore. It often inspires itself. I'm intrigued to bring in ideas of hiding the work of art. If the experiential perception of an artwork changes when seen then we can mitigate that effect by implying the artwork without seeing it. This is an idea I began to work with last year, by recording and presenting the artist's actions in the studio I invoked this idea of the unseen artwork. It’s also something I've been working back towards this year, however, this articulation of these ideas has led to me wanting to be more literal in the hiding of the artwork. The context of these plans would be that - It is not in the artwork that we find the ‘Art’ but in the experience of making it, and the experience of viewing it. (both of which are arguably level 1 activities, at least in the moment) The later of which happens regardless, it is the experience of making it that I would like to extend to the viewer, the practice of process. I believe hidden artworks, or hidden elements of them, would invoke that context. The artwork is implied, just as normally the act of making art is implied. George Dickie saw art as both evaluative and classificatory. I've been continuing to read Janaway's book 'Reading Aesthetics and Philosophy of Art' which states that Dickie saw the procedural side of art as more important than the functional. The end result isn't what matters when defining something as art, but instead it is the artists nomination and its relation to the 'artworld'. This seems to be the stance of many theorists and artists, and the idea has been articulated in many forms. It is a stance I follow, and one that is important in the understanding of what my work is and where it sits in wider context. Janaway, C. (2006) Reading Aesthetics and Philosophy of Art: Selected texts with interactive commentary. Pondicherry: Blackwell Publishing. In this experiment the box can be seen as a metaphor for our brains. A pertinent example of this would be our interpretation of colour. We all, mostly, agree on the standard definitions of colour, but the argument becomes more obvious when colours get specific. Working in an art institution for nearly five years I've regularly heard disagreements about colours, and we have no real way of knowing that what we see as green is what someone else is seeing. Pain is another obvious example, while there are obviously degrees of pain we have no reliable way of comparing our pain to that of another. Words, or more accurately their meaning, operate in the same way. How often have any of us said something that someone has taken the wrong way. It wouldn't be unreasonable to suggest that we all have. It isn't that much more of a leap to suggest that images are the same. As much of the research on this blog has shown, images, and by extension other artworks, have meaning that is integral to their existence. That meaning only exists when interpreted by a human, and those interpretations come through the reading of information. That information can be digital, visual, auditory, tactile or any number of sensory inputs. To define art as simply something beautiful or enjoyable on a basic level denies our own intelligence, and our capability to interpret information. Art, it could therefore be argued, contains, disseminates, and encourages the transfer of information. While there are many artworks whose information revolves around beauty, or the weirder sensory experience, there are many others that require a form of data processing, or interaction, from the viewer. If nothing else it's clear that is more information to be explored than we realise. I would argue that one of the purposes of art is to highlight that processing potential in regards to the world around us, and other areas of daily life. The reading of art encourages a creative thinking process, which can be applied to the world beyond the art gallery. There is a reason we can nominate the everyday as art, I would argue that this is because these objects have an element of inherent meaning attached to them. The nomination of them as ‘Art’ is a common activity, but maybe it is enough to think of them as art, or see them as art, at an individual level. We bring the meaning to the work, so can we bring it to other things just by imagining it. If I think that something I'm experiencing is Art, but never say it, is it any less Art than the painting on the wall? Does it matter that I'm an artist? Whose to say where the artwork lies? This section was added in addition to my initial post on taste. The information here is mostly from two short sources, that inspried more thinking. Later parts of this text slip into assumptive writing, so this post is more - thoughts inspired by research. Floyd, R. (2006) Wittgenstein : The Private Language Argument [Online] Philosophy Now. Available from: https://philosophynow.org/issues/58/The_Private_Language_Argument [Accessed 03.11.17]. Philosophy Bites (2017) ‘Elisabeth Schellekens Dammann on Disagreement About Taste’, Aesthetics Bites. [Podcast] Avaliable from: http://philosophybites.com/2017/04/elisabeth-schellekens-dammann-on-disagreement-about-taste.html [Accessed 01.11.17].